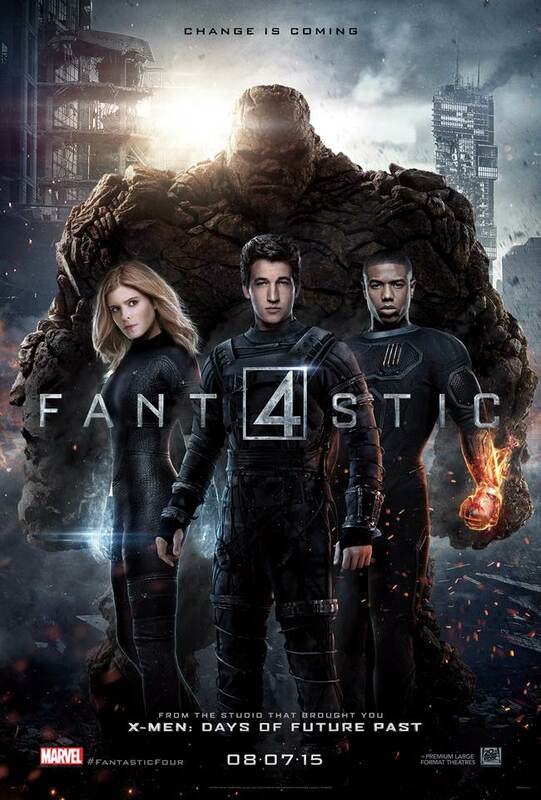 After rumors of production trouble and the unveiling of a particularly anemic Denny's tie-in menu (including a condiment called “punch-packing Thing Sauce"... ugh), buzz around Josh Trank's (CHRONICLE) FANTASTIC FOUR has been less than stellar. While there's precious little to love about the film, which re-imagines the origin of Marvel's first superhero team as a lumbering, almost actionless coming-of-age drama, its failures as a mid-summer action movie are, at the very least, unique. For example: it’s the first blockbuster I’ve seen where the entire third act is just barely longer than the credits that abruptly follow. For those who missed Trank's excellent Max Landis-penned debut feature CHRONICLE, the film tells the story of three normal teenagers who accidentally gain super powers and then must decide how - or if - to use them. Trank's FANTASTIC FOUR (co-written by the director, Simon Kinberg and Jeremy Slater), meanwhile, recasts the comic's quartet as high schoolers who accidentally gain super powers etc. etc. Where CHRONICLE was a found footage-style indie that sought to engage with operatic comic book storytelling on a small scale, FANTASTIC FOUR deigns to bring angsty character-driven drama to an over-the-top, super-powered fantasy, turning a comic about an accidental superhero team dealing with celebrity into a movie about some temperamental superhero teens dealing with self-actualization. From the moment the collage of comic book pages flip and shuffle into the Marvel logo, we know where this is going: Dude brainiac Reed Richards (Miles Teller), his lug of a BFF Ben Grimm (Jaime Bell), dudette brainiac Sue Storm (Kate Mara) and her Daredevil brother Johnny (CHRONICLE co-star Michael B. Jordon) will endure a horrific sci-fi accident and emerge with familiar extra-human abilities. And that’s all right. FANTASTIC FOUR makes enough changes to the origin story to justify its independent existence - it just doesn’t see them through with sufficient confidence to succeed. Reed, Sue, and a smarty-pants delinquent named Victor von Doom (Toby Kebbell) attend a prestigious science high school, where they’re working to teleport objects to and from an alternate dimension coined Planet Zero. But when the mean ol’ government wants to take over the project, the three prodigies, along with Johnny and Ben, decide to make a covert jaunt to Zeroland. Calamity ensues. Everything leading up to the Brundle-four teleporter mishap is a simplistic, predictable slog, from Victor’s and Reed’s competitive crush on Sue, to the group’s ultimate decision to buck authority and take the teleporter out for a spin. I felt absolutely no affection for this iteration of these characters. Except for Michael B. Jordan, who plays Johnny Storm with a casual confidence that’s far less grating than Chris Evans’ straining priggishness in the prior two films, all of the actors just kind of stand around and say their lines as if on a fantastic four milligrams of Ativan. Even Doom is played all slumping and dour. Still, the low-key performances could have expressed simmering intensity, adolescence angst, or scientific determination if the dialogue weren’t so lame. Does the good doctor intend to reference GHOSTBUSTERS when he proclaims, “There is no Victor. Only Doom!”? And how about when Reed excitedly describes the plot of his favorite book - 20,000 Leagues Under the Sea - with all the impassioned eloquence of a 4th grader mid show-and-tell? If FANTASTIC FOUR’s first half is slow and familiar, its second half is so bizarre and halting in both structure and pace as to be almost completely dysfunctional. It does feature the film’s two most compelling sequences: In the first, a newly empowered Reed Richards is bound to a laboratory table, his extremities stretched to their limit and flexing in time with the pain of the transformation. In the second, Dr. Doom, whose dumb and yet somehow unsettling character design falls somewhere in between Woody Allen’s SLEEPER and TETSUO: THE IRON MAN, wages a creepily leisurely assault on the staff of a research facility. Anyway, by now the four have super powers. There’s a significant time jump. There’s a military plot involving the teleportation technology and creation of super soldiers. The background narrative unfolds like a typical comic book movie, but Trank is so unwilling – or else unable – to film effective action, he pitches his focus on the still one-dimensional characters until barely ten minutes remain, when he finally relents and throws everyone together for an abbreviated CGI dust-up. While I respect the director’s attempt at making a headier, more dramatic superhero film, his bid to mitigate brainless action with genuine pathos has resulted in a film that fails on both levels. I know it fails at action because the two most compelling sequences feature a dude tied to a bed and a guy walking down a hallway.